HITS » Tickets on sale NOW for the Longines FEI World CupTM Thermal 2018! Tickets on sale NOW for the Longines FEI World CupTM Thermal 2018! 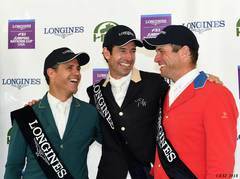 Longines FEI World CupTM Thermal 2018! Purchase your tickets now online here! Refreshments: Spectators can grab lunch from the HITS Restaurant Pavilion and find a grassy spot on the berms or bleachers to eat while watching some of the world's best show jumping.